Portrait of Francis Greenwood Peabody. From the First Parish in Cambridge Archives. To the doctrine of horizon as applied to industrial affairs must be added the Christian doctrine of industrial progress. Jesus not only surveys the world of business from above, but approaches it from within. His method begins with the individual. His supreme intention is that of making persons who shall in their turn make the kingdom of God. Here, then, is a test to be applied to any form of industrial life. Instead of estimating the economic advantages or disadvantages of a form of industry, the teaching of Jesus weighs it as a contribution to character. Of any industrial programme or proposition Jesus asks, not whether it will pay, or will be extravagant, or difficult to administer’ but rather, what sort of people will it be likely to produce. In the making of goods will it make good characters; or, while making cheap products, will it also make cheap men? This is a point of view from which any commercial system may be fairly considered. 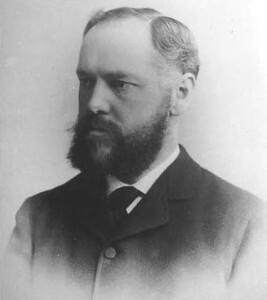 Francis Greenwood Peabody (1847-1936) was minister of the First Parish for only five years, form 1874 to 1879, when he resigned because of recurrent illness. But he was a member of the Parish throughout a long life, and his influence continued there. He was appointed to to faculty of the Divinity School in 1880, where he developed pioneering courses on Christian social ethics. He soon became an important figure in the development of the “social gospel” — that is to say, the obligation for religion to be concerned with problems arising from the urbanization and industrialization of American society. 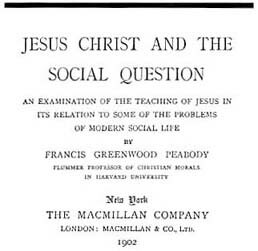 His most widely read discussion of these issues was Jesus Christ and the Social Question (1900). His social philosophy called for social reform rather than a radical reconstruction of society, and emphasized cooperation rather than class conflict. His writings today necessarily seem rather conservative. But the important contribution of his career was his insistence on the application of religion to social problems at a time when it was generally supposed to be concerned only with individual salvation. Jesus Christ and the Social Question (1902). 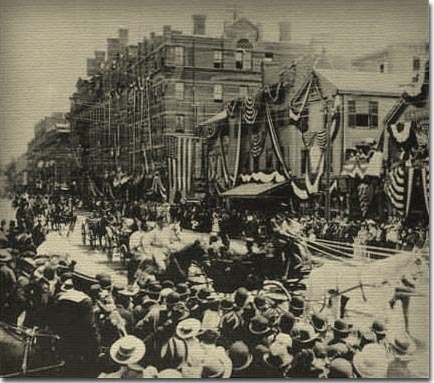 On June 3, 1896, Cambridge celebrated its 50th birthday with a mammoth parade.